A new report says that 93 % of Americans have NEGATIVE FEELINGS about the car sales process. 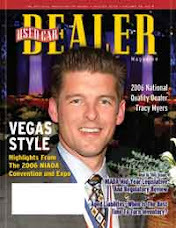 Tracy Myers, owner of Frank Myers Auto Maxx, believes the industry as a whole is headed in the wrong direction and hes ready to start a revolution. "At Frank Myers Auto Maxx, were committed to a better process and a better experience" said Myers. "This month I'm tackling 3 major car buying problems." One: If youre driving a car you hate but you owe more than its worth...No Problem! When you buy ANY Certified vehicle, well pay off your trade! Running or not, regardless of condition! Two: You cant come up with a down payment for a nicer, newer car? No problem! Weve got programs starting with as little as NO MONEY DOWN! Three: If youve made mistakes in the past with your creditDont worry! You'll be offered financing or Uncle Frank will pay you $1000...GUARANTEED! However, Myers states that there is a stipulation. "I've sat down with my accountant and he told me I can only do this for the first 87 customers, so dont miss out! Call the dealership TODAY at (336) 767-3432 or visit http://www.frankmyersauto.com/"